Necrotizing soft-tissue infections (NSTIs) are potentially life-threatening medical emergencies that encompass a devastating and rapidly spreading destruction of soft tissue with associated systemic toxicity. NSTI is a rare diagnosis with a wide spectrum of presentations in the emergency department (ED). The most significant challenge associated with NSTI is establishing an early diagnosis. Skin may not be involved initially, which may delay treatment in a patient who may appear healthy. During the first stages, NSTIs may be confused with cellulitis or other superficial skin infections. The infectious process can be located anywhere in the body, with a characteristic rapid progression of the infection site and hyperacute systemic deterioration of the patient. NSTI is pathophysiologically characterized by effects of bacterial toxins and enzymes (eg, hyaluronidase) that enable horizontal extension through the fascial planes, leading to intravascular thromboses and ischemic necrosis with disturbance of the host’s humoral and cellular immune response. 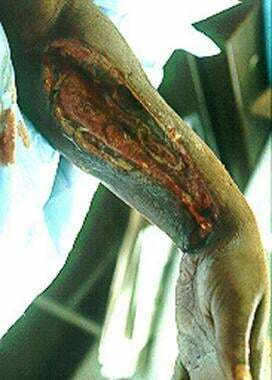 The infection is usually polymicrobial. Typical pathogens include group A beta-hemolytic Streptococcus, Staphylococcus aureus (including community-associated methicillin-resistant S aureus [CA-MRSA]), Enterococcus, Enterobacteriaceae, Bacteroides, and clostridia. Some of the clinical manifestations of NSTI include rapidly evolving signs of systemic compromise and devastating infection with signs of tissue destruction, skin manifestations of blistering, and hemorrhage with crepitus. Spontaneous gangrenous myositis (also known as spontaneous streptococcal gangrenous myositis, group A streptococcal necrosis, or streptococcal myonecrosis) is very rare. It is characterized by rapidly progressing necrotizing S pyogenes infection of skeletal muscle, usually preceded by influenzalike symptoms. NSTI can be classified based on microbial etiology. Type I infections are the most common and are polymicrobial. [1, 6] Type II NSTI is monomicrobial in etiology and is associated with streptococci, staphylococci, and clostridia. 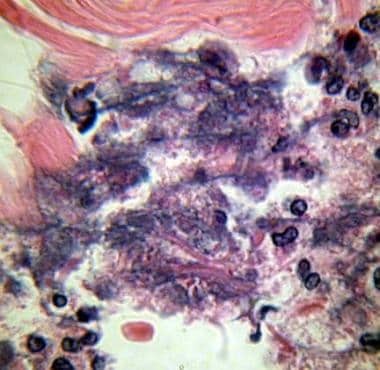 Staphylococcal NSTI is increasing in prevalence owing to more cases of MRSA infection and association with intravenous drug use, particularly the use of black tar heroin. Myonecrosis, which is characteristically associated with clostridial infection, may result in a bronze color, followed by hemorrhagic bullae, dermal gangrene, and, finally, crepitus. Nonclostridial infections are usually associated with erythema, pain, and swelling but are frequently initially identical to simple cellulitis. An apparent superficial cellulitis that fails to respond to standard antibiotic therapy and that progresses rapidly, resulting in systemic toxicity, should raise suspicion for necrotizing soft-tissue infection (NSTI). A seroma with partial or complete dehiscence of a recent operative incision are potentially suggestive of necrotizing infection. The patient should be returned to the operating room for tissue biopsy and thorough examination of all layers of the skin, subcutaneous tissue, fascia, muscle, and peritoneum. NSTIs can be difficult to diagnose early in the disease course, as initial signs and symptoms can be typical of cellulitis. As mentioned above, the classic examination finding of pain out of proportion to examination or pain extending beyond the border of infection are both concerning for NSTI. Hemorrhagic bullae, ecchymosis, and crepitus are later findings. It is common for patients with NSTI to present with signs of systemic toxicity due to a systemic inflammatory response caused by cytokine release. However, some patients with underlying chronic illness may be relatively immunosuppressed and demonstrate a less-dramatic presentation. Some patients present with “la belle indifference” and, despite a severely infected extremity, seem inappropriately unbothered, which may be a result of local ischemia causing the skin to become insensate. Photomicrograph of Fournier gangrene (necrotizing fasciitis), oil immersion at 1000× magnification. Note the acute inflammatory cells in the necrotic tissue. Bacteria are located in the haziness of their cytoplasm. Courtesy of Billie Fife, MD, and Thomas A. Santora, MD. When evaluating a patient for possible NSTI, the border of erythema should always be marked upon initial evaluation to assess for rapid advancement. 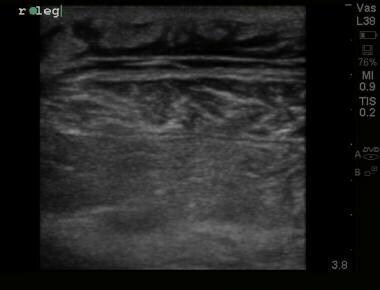 Emergency ultrasonography can also be used to aid in the diagnosis by revealing similar findings of thickened or irregular fascia or fluid along the fascial planes. [28, 29] See the image below. Ultrasound image demonstrating thickened, irregular fascial plane with edema within underlying muscle representing myonecrosis in patient with confirmed necrotizing fasciitis. The Laboratory Risk Indicator for Necrotizing Fasciitis (LRINEC) score has been used to gauge the likelihood of a necrotizing skin infection. The LRINEC score includes 6 variables associated with NSTI and are used to calculate a score correlating to the risk of NSTI (see tables 1 and 2 below). Patients with an LRINEC score of 6 or higher have been considered at highest risk for the presence of a necrotizing infection. However, an LRINEC score of 6 or less cannot be used to rule out the diagnosis completely. Patients still need a thorough evaluation to rule out the disease. Not included in the LRINEC score is a serum lactate level, which, if elevated, should also increase concern for NSTI. Patients with concern for NSTI can rapidly deteriorate and should be reevaluated frequently. Obtain intravenous access in the unaffected extremity and begin fluid resuscitation with normal saline or lactated Ringer solution. Administer adequate intravenous broad-spectrum antibiotics, as the etiology can be polymicrobial. Consider supplemental oxygen and intubation in patients with hypoxia or altered mental status. Electrolyte replacement is initiated as needed. Immediate surgical consultation is indicated when necrotizing soft-tissue skin infection (NSTI) is suspected. A surgeon should be promptly consulted for definitive management. Tetanus status should be assessed and updated, if indicated. Aggressive surgical debridement of all necrotic tissue is the definitive treatment of necrotizing soft-tissue infections (NSTIs). Although pus may be nearly absent, the wounds can discharge copious amount of tissue fluid. Antibiotic treatment alone without surgical intervention leads to progressive sepsis. Debridement is best accomplished by early and extensive incision of skin and subcutaneous tissue wide into healthy tissue, followed by excision of all necrotic fascia and nonviable skin and subcutaneous tissue. Obtain early surgical consultation for aggressive debridement in cases of suspected necrotizing soft-tissue infection (NSTI) without delay for results of laboratory or radiology studies. Consider surgical subspecialty consultation for necrotizing fasciitis involving specific anatomic areas such as urology in cases of Fournier gangrene. Consultation with an infectious diseases specialist may help guide initial empiric antibiotic therapy. If the current facility is not capable of handling the aggressive care, monitoring, and serial surgical debridement that these patients require, arrangements for transfer should be made. However, patients should not be considered for transfer until they remain hemodynamically stable. Anaya DA, Dellinger EP. Necrotizing soft-tissue infection: diagnosis and management. Clin Infect Dis. 2007 Mar 1. 44(5):705-10. [Medline]. Kobayashi L, Konstantinidis A, Shackelford S, Chan LS, Talving P, Inaba K. Necrotizing soft tissue infections: delayed surgical treatment is associated with increased number of surgical debridements and morbidity. J Trauma. 2011 Nov. 71(5):1400-5. [Medline]. Boyer A, Vargas F, Coste F, Saubusse E, Castaing Y, Gbikpi-Benissan G. Influence of surgical treatment timing on mortality from necrotizing soft tissue infections requiring intensive care management. Intensive Care Med. 2009 May. 35(5):847-53. [Medline]. Bosshardt TL, Henderson VJ, Organ CH. Necrotizing soft-tissue infections. Holzheimer RG, Mannick JA, eds. Surgical Treatment: Evidence-Based and Problem-Oriented. Munich: Zuckschwerdt; 2001. Phan HH, Cocanour CS. Necrotizing soft tissue infections in the intensive care unit. Crit Care Med. 2010 Sep. 38 (9 Suppl):S460-8. [Medline]. Marx J, Hockberger R, Walls R. Rosen's Emergency Medicine - Concepts and Clinical Practice. 8th ed. Philadelphia: Elsevier Saunders; 2014.
de Prost N, Sbidian E, Chosidow O, Brun-Buisson C, Amathieu R, Henri Mondor Hospital Necrotizing Fasciitis Group. Management of necrotizing soft tissue infections in the intensive care unit: results of an international survey. Intensive Care Med. 2015 Aug. 41 (8):1506-8. [Medline]. McHenry CR, Piotrowski JJ, Petrinic D, Malangoni MA. Determinants of mortality for necrotizing soft-tissue infections. Ann Surg. 1995 May. 221 (5):558-63; discussion 563-5. [Medline]. Sunderkötter C, Becker K. Frequent bacterial skin and soft tissue infections: diagnostic signs and treatment. J Dtsch Dermatol Ges. 2015 Jun. 13 (6):501-24; quiz 525-6. [Medline]. Bakleh M, Wold LE, Mandrekar JN, Harmsen WS, Dimashkieh HH, Baddour LM. Correlation of histopathologic findings with clinical outcome in necrotizing fasciitis. Clin Infect Dis. 2005 Feb 1. 40 (3):410-4. [Medline]. Paz Maya S, Dualde Beltrán D, Lemercier P, Leiva-Salinas C. Necrotizing fasciitis: an urgent diagnosis. Skeletal Radiol. 2014 May. 43 (5):577-89. [Medline]. Tilkorn DJ, Citak M, Fehmer T, Ring A, Hauser J, Al Benna S, et al. Characteristics and differences in necrotizing fasciitis and gas forming myonecrosis: a series of 36 patients. Scand J Surg. 2012. 101 (1):51-5. [Medline]. Lin TY, Ou CH, Tzai TS, Tong YC, Chang CC, Cheng HL, et al. Validation and simplification of Fournier's gangrene severity index. Int J Urol. 2014 Jul. 21 (7):696-701. [Medline]. Woodburn KR, Ramsay G, Gillespie G, Miller DF. Retroperitoneal necrotizing fasciitis. Br J Surg. 1992 Apr. 79 (4):342-4. [Medline]. [Guideline] Frazee BW, Fee C, Lynn J, Wang R, Bostrom A, Hargis C, et al. Community-acquired necrotizing soft tissue infections: a review of 122 cases presenting to a single emergency department over 12 years. J Emerg Med. 2008 Feb. 34 (2):139-46. [Medline]. Brook I. Microbiology and management of soft tissue and muscle infections. Int J Surg. 2008 Aug. 6 (4):328-38. [Medline]. Olsen RJ, Musser JM. Molecular pathogenesis of necrotizing fasciitis. Annu Rev Pathol. 2010. 5:1-31. [Medline]. Wong CH, Chang HC, Pasupathy S, Khin LW, Tan JL, Low CO. Necrotizing fasciitis: clinical presentation, microbiology, and determinants of mortality. J Bone Joint Surg Am. 2003 Aug. 85-A (8):1454-60. [Medline]. Hsiao CT, Weng HH, Yuan YD, Chen CT, Chen IC. Predictors of mortality in patients with necrotizing fasciitis. Am J Emerg Med. 2008 Feb. 26 (2):170-5. [Medline]. Rivers E, Nguyen B, Havstad S, Ressler J, Muzzin A, Knoblich B, et al. Early goal-directed therapy in the treatment of severe sepsis and septic shock. N Engl J Med. 2001 Nov 8. 345 (19):1368-77. [Medline]. Amitai A, Sinert R. Necrotizing fasciitis as the clinical presentation of a retroperitoneal abscess. J Emerg Med. 2008 Jan. 34 (1):37-40. [Medline]. Krieg A, Dizdar L, Verde PE, Knoefel WT. Predictors of mortality for necrotizing soft-tissue infections: a retrospective analysis of 64 cases. Langenbecks Arch Surg. 2014 Mar. 399 (3):333-41. [Medline]. Anaya DA, Dellinger EP. Necrotizing soft-tissue infection: diagnosis and management. Clin Infect Dis. 2007 Mar 1. 44 (5):705-10. [Medline]. Lille ST, Sato TT, Engrav LH, Foy H, Jurkovich GJ. Necrotizing soft tissue infections: obstacles in diagnosis. J Am Coll Surg. 1996 Jan. 182 (1):7-11. [Medline]. Yen ZS, Wang HP, Ma HM, Chen SC, Chen WJ. Ultrasonographic screening of clinically-suspected necrotizing fasciitis. Acad Emerg Med. 2002 Dec. 9 (12):1448-51. [Medline]. Oelze L, Wu S, Carnell J. Emergency ultrasonography for the early diagnosis of necrotizing fasciitis: a case series from the ED. Am J Emerg Med. 2013 Mar. 31 (3):632.e5-7. [Medline]. Ali SZ, Srinivasan S, Peh WC. MRI in necrotizing fasciitis of the extremities. Br J Radiol. 2014 Jan. 87 (1033):20130560. [Medline]. Koch C, Hecker A, Grau V, Padberg W, Wolff M, Henrich M. Intravenous immunoglobulin in necrotizing fasciitis - A case report and review of recent literature. Ann Med Surg (Lond). 2015 Sep. 4 (3):260-3. [Medline].